The National Weather Service has posted a Winter Weather Advisory effective from 1:00am tonight until 1:00pm tomorrow afternoon. One to three inches of snow is possible as a system moves through the area. There could be a little more than that north and east of Baltimore, where up to 4 inches is possible according to the weather service. 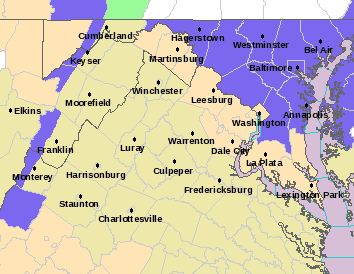 The areas in purple are under a Winter Weather Advisory from 1am tonight until 1pm tomorrow. The Mega Millions drawing on New Year's Eve failed to produce a winner. The jackpot for tonight was originally announced to be around $290 million, but with robust ticket sales climbed to $330 million. Further, this afternoon, Mega Millions announced that ticket sales had kept up their pace. The current estimated jackpot for the drawing tonight is $355 million! Washington area residents flocked to the nearest lottery ticket seller for their chance to win big. All of the locations The Capital Region Pulse checked today were bustling with customers. Colesville Beer and Wine in Silver Spring, MD had quite the line during the afternoon hours on Tuesday. Dominic's Pizza, also in Silver Spring hosted the normal Tuesday crowd with the addition of hopeful lottery players. It seems as though everyone is leaping at the chance to win this near-record jackpot. So what would you do with the money? Discuss it in the comment section below or on our Facebook Page. For those of you trying your luck tonight, good luck! The first day of the new year featured more than just celebration for residents near Fairland Recreational Park in Burtonsville. Maryland-National Capital Park Police officers responded to a call of gunshots around 3:15pm on January 1. The officers were able to locate three adults firing weapons at makeshift targets. 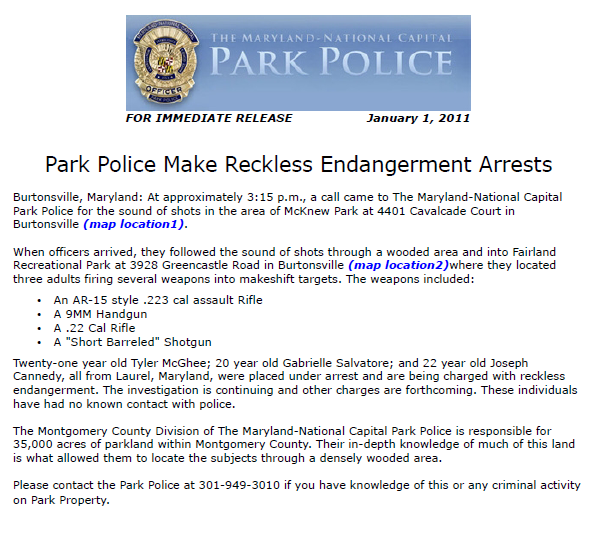 The Maryland-National Capital Park Police are responsible for law enforcement within area parkland. They also regularly work alongside other local police agencies. Park Police officers are tasked with patrolling the areas parkland, like this park in Montgomery County, MD. As always, our readers are given a look at the raw information we receive. 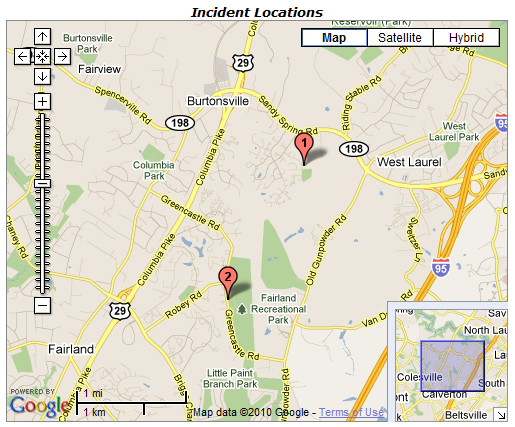 The unabridged press release is featured below with a map of the locations involved. The day after a man was killed at Suburban Hospital in Maryland, police have identified the victim as Roosevelt Brockington, Jr. Brockington was 40 years old, and from Lusby, Maryland. Police have not announced a suspect at this time, and a motive is also to be determined. Suburban Hospital was locked down for a period of time yesterday while police searched for the suspect within the hospital. Each room was carefully searched before the hospital was allowed to return to normal operations. Hospital officials were insistent that patients and staff were safe during this time. After the lockdown ended, police stated that they did not believe the suspect was within the confines of the hospital. During the lockdown, emergency room patients were rerouted to other hospitals in the area ad visitors were not allowed to enter. As always, we want our readers to have access to the raw information that we receive. 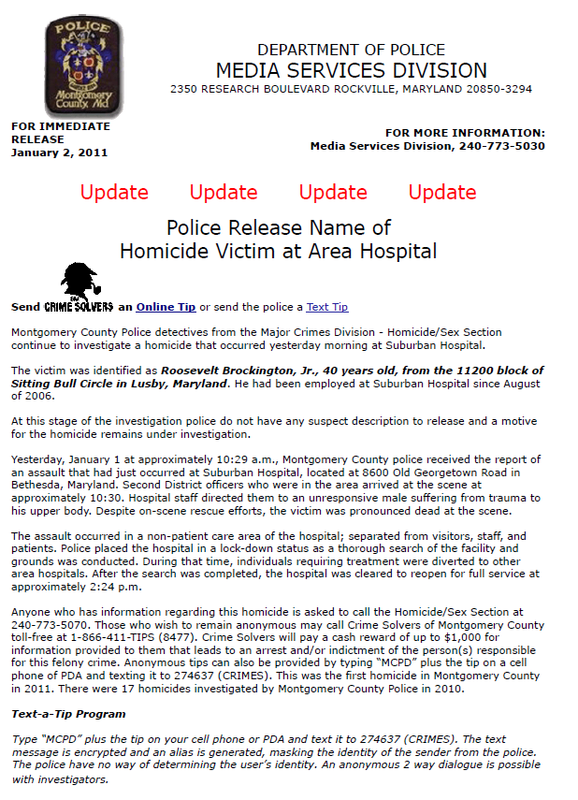 We have posted the press release from Montgomery County Police below. The Capital Region Pulse reported yesterday on a missing teenager from White Oak, MD. Montgomery County Police have announced that the teen has been recovered. She was safe, and unharmed. The staff at The Capital Region Pulse would like to remind everyone that critically missing children cases will always be posted to our website. We are always willing to support the search for missing children.